Sweet Little Mary, The Pride of the Dairy. Copyright, 1893, by Frank Harding. Words and Music by Arthur West. So come to the wedding of Mary and me. But I think she'll say yes, and not try to look vexed. 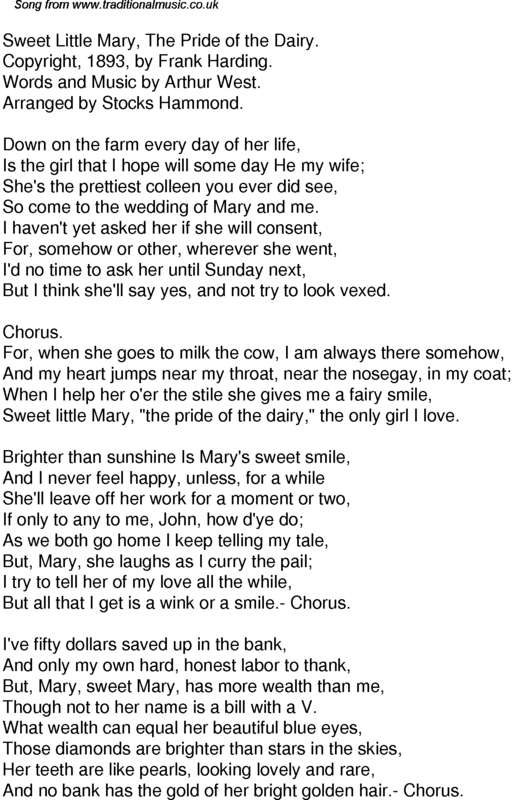 Sweet little Mary, "the pride of the dairy," the only girl I love. But all that I get is a wink or a smile.- Chorus. Though not to her name is a bill with a V.
And no bank has the gold of her bright golden hair.- Chorus.